We can all picture that one fence down the road or across town that is stunning in its beauty and elegance. Whether it is a white picket fence, a large and ornamental iron fence, or anything in between, the right fence has a way of drawing attention to the property around it and creating a sense of beauty and appeal. 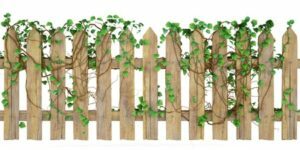 If you want to achieve that effect with your own fence, consider learning how to plant climbing vines and flowering plants that will enliven and transform the appearance of your fence. Before anything else, you need to identify which plants have the ability to grow gracefully along your fence. It is important to consider the Florida climate to ensure that the plants you choose can endure months of harsh heat and sunlight. Fast-growing fence cover plants include annuals like passion flower, morning glory, hops, and hyacinth bean. If you have more time on your hands and prefer to use a perennial that won’t grow as quickly, consider options like dutchman’s pipe, trumpet vine, climbing hydrangea, and honeysuckle. Evergreen plants also make gorgeous additions to any fence, especially English Ivy. About four feet off the ground, drill ⅛-inch diameter holes in your fence every six feet and turn a screw eye into each hole with a screwdriver. Next, twist galvanized wire around one screw eye, pull it tightly, and twist it around every screw eye along the fence until completed. Complete this step with holes drilled two feet off the ground every six feet apart. Once this basic support structure is built, prepare the ground at the base of your fence for planting. Depending on the condition of the land, you may need to loosen the soil, till, spread compost, and fertilize. Install your selected plants into the ground, then carefully hold the vine tendrils and wrap them around the hanging lengths of galvanized wire. Water the plants as needed and watch as the vines grow and add an irreplaceable beauty to your fence! If you need a fence to get this whole process started, call West Florida Fence now at (813) 251-5883 to request a quote and learn what fencing options are available to you. From privacy fences and pool fences to security enclosures, the experts at West Florida Fence can do it all.